HI San Diego - Point Loma v San Diego, USA: Zarezervujte nyní! Ocean Beach and its accompanying nightlife, cafes, restaurants, shops and weekly Farmer's Market are just a short stroll away. Nearby, Sea World and Mission Bay are just a 5 minute drive or 20 minute bus ride away. Balboa Park, the world famous San Diego Zoo, and Downtown San Diego are 10 or 30 minutes away by car and bus respectively. 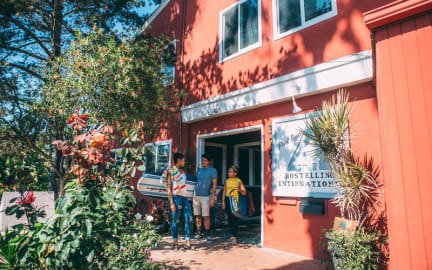 The hostel features a laid-back atmosphere with a beautiful, sunny courtyard complete with table tennis, a fire pit, gas BBQ, and plenty of spots to relax. There is also a large, open kitchen that's perfect for cooking and sharing your favorite meals and a comfy, spacious lounge with a big screen smart TV. A variety of dorms, private and king rooms are available. If you don't see it available contact the hostel directly. Superior King room types can have one king or two twins. Please specify at time of booking. Tax is not included in rates. Tax for San Diego is 10.50%. Hostelling International is a non-profit membership based organization. Non-members will be asked to pay for a $4 daily per night or $18 yearly membership upon check-in. Guests under 18 must be accompanied by a parent or guardian or have a liability release from a parent or guardian (please ask hostel, limitations apply). Max number of days is 14 nights within one calendar year. Please be aware that we are only for travelers so we do not allow San Diego County residents to check into our hostel.